So sorry for the delay in the blog this week, we have been cooking up some PRETTY fun things that kept us very very busy! So let's get to it, we are talking everyones favorite trend so far this YEAR. Yes, thats right this year from season to season we have seen it, and as we look forward at our spring collections it surely is not going anywhere. As you know, its is one of our personal favorites, and from what we can tell since we can not keep it on our racks, it seems as though it is EVERYONES favorite. We are finding that camo is basically the new black and you can wear it with pretty much anything. Of course we are here to give you our picks from top to bottom, we got you covered in the camo department! From leggings to skirts you can dress up or down in camo! This week, we're going with dress up in our Wild Honey camo mini skirt, pair it with literally whatever color sweater you want, some tights and a pair of booties and you'll be set for a night out or a holiday party in this cutie! If you're like us, who want to stay comfy and never leave the couch, no worries we have an adorable distressed pair of camo leggings that will work for you! We LITERALLY have any style top you could possibly want in a camo print. Jackets, hoodies, thermals you name it we have it. And since it feels like its below zero today, we're going to show you THREE of our favorite jackets on the floor right now! Our KUT studded camo jacket has been a hit with its comfortable material and the studded detail, you will want to grab this to put over any sweater or tee you have. Don't worry curvy girls, we never forget about you! 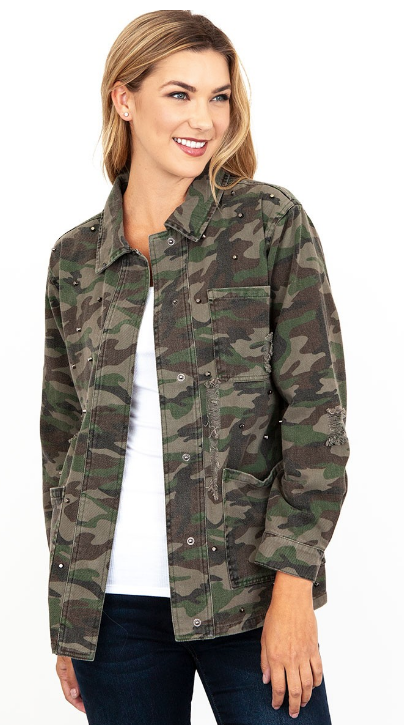 Our washed camo utilitarian jacket is a MUST HAVE. It has a drawstring waist to pull you in at just the right spot, and a zip up front to keep you nice and warm throughout these next few unbearably cold months. Our final pick, and Meghan's absolute favorite item she refuses to take off is our reversible camo bomber! The black velvet inside is TO.DIE.FOR, you will fall in love just like she has! As always, if you need help styling your camo outfits we are here!